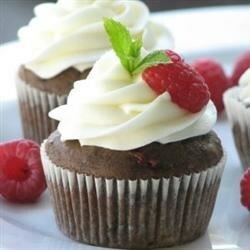 "Very tasty cupcake with zucchini to add moisture, raspberries, and chocolate for a sweet and tart flavor." Whisk together the flour, cocoa, and baking soda; set aside. Beat the butter and sugar with an electric mixer in a large bowl until light-colored and fluffy. Add the eggs one at a time, allowing each egg to blend into the butter mixture before adding the next. Beat in the vanilla with the last egg. Pour in the flour mixture alternately with the buttermilk, mixing until just incorporated. Fold in the zucchini, raspberries, and chocolate chips, mixing just enough to evenly combine. Spoon the batter into the prepared muffin cups, filling each 3/4 full. Bake in the preheated oven until a toothpick inserted into the center comes out clean, about 20 minutes. Cool in the pans for 10 minutes before removing to cool completely on a wire rack. Very tasty cupcakes. For those worried, you can not taste the zucchini at all. I did have to cook mine a little longer, but believe it is my oven. Very good. I will make again. more chocolatey than I wanted.